In poker, the term pocket, as in "hidden in my pocket," refers to all cards that the opponent cannot see. 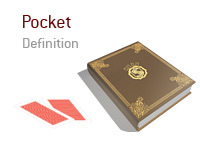 The term pocket card is a synonym for hole card, which is any card that the dealer deals to the player facedown. The opposite of a pocket card is an open or face-up card. Not all poker variants use open cards; games that do often use them as community cards, which means that the face-up card is available as part of any player's hand. One of the most popular uses of the word pocket is in the term pocket pair. Pocket pairs, which are often some of the most valuable starting hands, are two pocket cards of the same rank, such as pocket sixes or pocket queens. The distinction between a pair of queens and pocket queens is that the aspect of being "in the pocket" is not obvious. In a game of five-card draw, the term pocket queens is redundant because there are no open cards in play. Unique names exist for very valuable pocket pairs. The best Texas Hold'em starting hands are pocket aces, called pocket rockets or American Airlines, pocket kings, called cowboys or King Kong, and pocket queens, called ladies.